Q&A: Do I Need To Break In New Tires? A: Just like a new pair of shoes, your new tires need to be “broken in” for comfort and performance. Unlike a new pair of shoes, there’s a real safety aspect to the reasoning behind the breaking in period as it applies to tires. During manufacturing, tires are coated with a release lubricant to help them release from their molds after the curing process. Some of the lubricant remains on the surface of the tires, and until this layer completely wears away it can noticeably reduce traction, making sharp accelerations or turns slippery and potentially dangerous. About 500 km of easy driving passes quickly and will ensure the lubricant is worn off safely and completely. Tires are composed of several layers of materials including rubber, steel, and fabric. Driving sensibly for 500 km allows time for the load of your vehicle to naturally break these layers in, and the different components to start working together. This will deliver the best performance and ride quality. If you’ve just replaced your tires, it’s probably because your old tires had very little tread left. With worn treads the tires tend to respond a bit quicker, because there’s less tread there to flex and grab the road during cornering and quick turns. 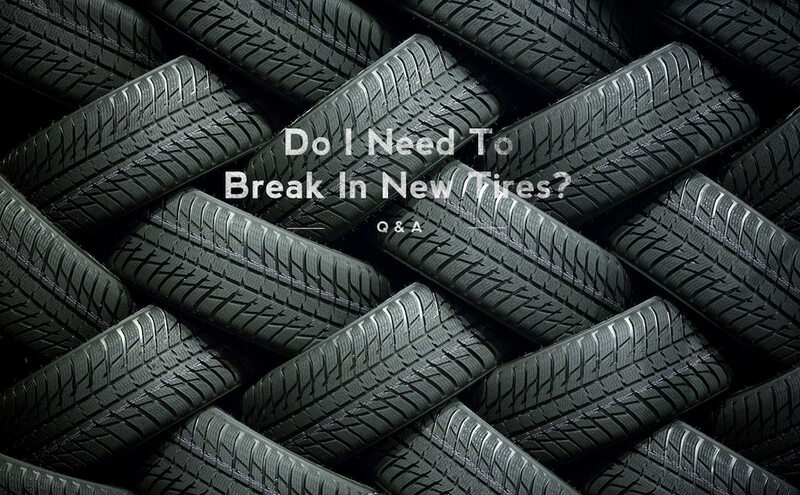 You might notice your new tires feel quite different, and more sticky in the turns due to the deeper tread that tends to flex and be less responsive than your old tires. Even if you have replaced your old tires with the exact same brand and model. It’s exciting to get new tires and you probably want to test out that rubber, everyone from automotive professionals to Harley riders know the benefits to taking it easy for a couple of weeks. Be patient and don’t try to artificially hurry the process along by scuffing your tires with soap and steel wool, as there’s no way to tell if the lubricant is actually completely off or not. Let your tires break in naturally, which is nothing more than going easy in the first couple of hard corners until the shine is knocked off them.